Welcome to Hotel Medsur-Natura Park! 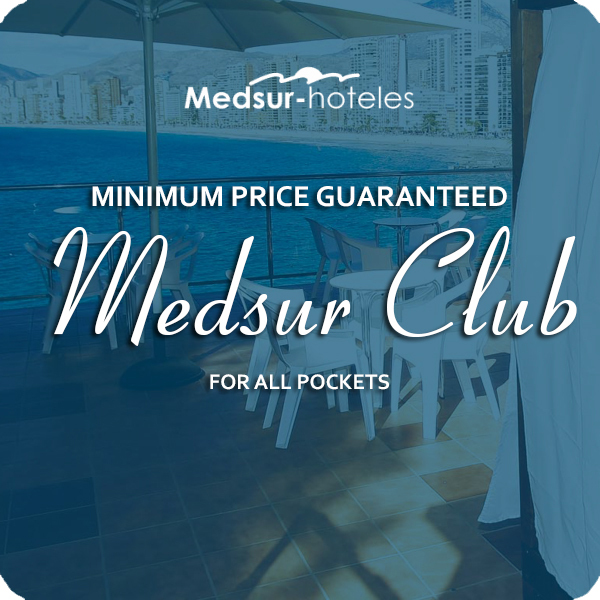 The Hotel Medsur-Natura Park can be found at just 100 mts, from the beach in “Coma-ruga”, one of the coastal neighborhoods in “El Vendrell”. Only 4 kms. from the town, Coma-ruga is characterized among other things for its peace and quiet and for the charm itself of the Costa Dorada. Bathed by the Mediterranean, its beaches, which cover 7 kms., have been awarded with the Blue Flag since 1998 and are perfect for children because of its fine sand and shallow water. Furthermore, the water has a high content of iodine, which makes it very beneficial for our health. Our beach also has a thermal water spring which forms a river flowing into the sea, where it is normal to see people bathing all year round. This is why “El Vendrell” was declared a Thermal Town in 2004. Como-ruga is situated near the important spots of tourist interest such as Barcelona (70kms. ), Tarragona (33kms. ), Reus (44kms. ), el parque temático “Port Aventura” (46kms.). The Foundation and museum dedicated to the world famous musician “Pau Casals” (Pablo Casals) is to be found in El Vendrell. For all this and much more, Hotel Medsur-Natura Park and Coma-ruga are an ideal destination to enjoy the sun and beach with the family, a quiet escape with friends or partners, an exciting visit to Port Aventura or a day for shopping and visiting the best museums and art galleries in Barcelona. The Hotel Medsur-Natura Park, has 220 spacious, exterior rooms with large terraces. They are fitted with two 1,35 mts beds and have a full bathroom with complimentary articles, hair-dryer, heating and air-conditioning, flat screen satellite T.V., telephone, and a safe box (optional) and fridge (optional). If you need an iron you can ask for it in reception. If you would like to wake up to a view of the sea and Coma-ruga beach in the morning, you can ask for our sea-view rooms at a small extra charge per night. Nature Park is a hotel with easy access and provides adapted rooms at no extra charge. To be certain of the availability of such rooms it is best to reserve them in advance. If you need a cot or extra bed, we can supply one on demand and according to availability. The cost of a cot is 7 euros per night. The extra beds are at no extra charge, but as we said before, it depends on the availability. If you are travelling in a group, with family or friends, and need several rooms, you can mark this on the reservation form and we will try our hardest to give you adjoining rooms, or as near as possible. Do you want a special price for your vacations? 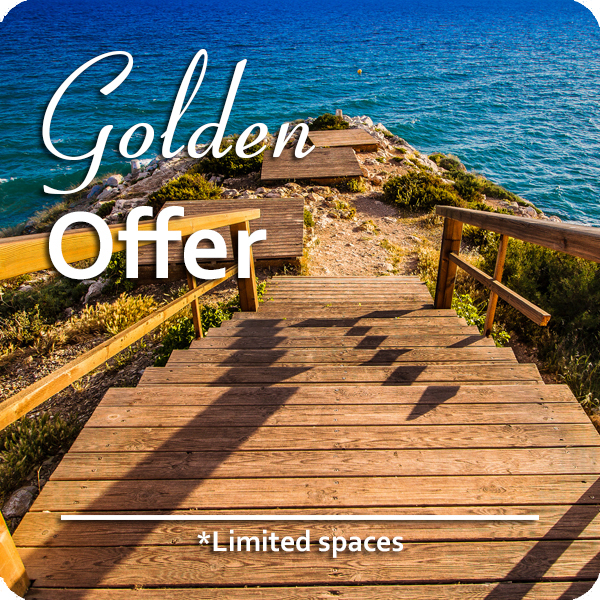 Select our “Golden Offer” and enjoy your stay in one of our 3 stars hotels in the White Coast. Have a break. Do you fancy a break for a snack, a refreshment or maybe and ice-cream? Our staff in the café and restaurant is at your disposition at any moment of the day. We make an effort every day so that everybody can always find something that fits their taste and needs. We like to share local products and recipes for you to get to know the gastronomic culture of the area. We offer a wide list of drinks and enjoyable cocktails in our café. Don’t forget to ask for our special offers and contests. Take your own photo with us, share it on Instagram or Twitter and enjoy special offers and discounts in the café. -Opening times of the café are: From 10.00 am. to mid-night. If you are a Celiac or have a food alergy of any sort, don’t doubt in letting us know. Comment it on your reservation or tell us at reception when you arrive. The person in charge will contact you in order to prepare the menu for your stay. We also have the information refering to the allergic content of our menus. In the buffet, the young members of the family can have a small-size menu during the summer season (approximately mid-June to mid-September) We can also provide high-chairs. Drinks are not included in the meal rates. Have fun with us! Our entertainment team has organized a load of surprises for all ages. Games, contests, dances, activities in family groups and with friends, and of course for the younger members of the family. We also organize activities outside the hotel like games on the beach or trips to the market. We hold parties, live music, acts and special shows nightly. A happy stay begins with a cordial welcome. Our staff in the reception department is at your disposition 24/7 to help you, answer any questions and solve any doubts. Our aim is to help you enjoy your stay 100%. Allow us to advise you. To avoid oversleeping and arriving late for any excursion or appointment, we have a call service.. The day you are leaving you may leave your luggage in reception at no extra charge, until you are ready to go. If you need a taxistrong> or a rented carstrong>, don’t be afraid to ask us. We can arrange it. Natura Park has and outdoor covered parking area. The price is 6.50€ per night but we cannot reserve places. Ask about availability on your arrival. If you are going to spend a whole day out, but you are paying for Full Board, you can tell us the day before and we can prepare a picnic for you to take along. Dogs under 5 kilosstrong> are welcome at Natura Park as long as you specify it when you make your reservationstrong>. As we know you like to be in contact with others, we provide Wi-fi service free of charge in all the hotel.. The Sant Vicenc de Calders station (1.5 kms from the hotel) You can get a taxi to the hotel from there.